I am in the process. More accurately, a couple of days ago I pulled myself out of the 2-month stagnation process, thanks to this post of Sandy Millin about how she actually is learning Russian. Thanks again, Sandy, for this unintended nudge, which I’m just hopeful will mean effort on my part for more than a few days after this post is out. Over to the more detailed answer to the question in the title. I am learning, of course. Am I enjoying Japanese? Very much. Am I progressing? Well, I believe I am. Am I happy with my progress (and myself learning)? Not at all. The funniest thing for me here was to look back and track out my post of Dec 3, 2013, the moment when, having studied Japanese for a whole one long week, I came up with morals and lessons, both for myself, for students, and for the community. Little did I know then what months ahead had in store. (1) display the viewable fruit of my effort and tell about my studies. Explain, comment. (3) .. and not despair. Most basic Kanji characters taped to the wall in front of my desk. That really means I look at these every day. I can recognize, draw and pronounce the highlighted ones. My confession, one I never imagined myself making, is that I love kanji. I’m also quite keen on hiragana symbols and think they look attractive (maybe that’s why I managed to learn them easily), but katakana syllabary just won’t settle in and really causes frustration at times. 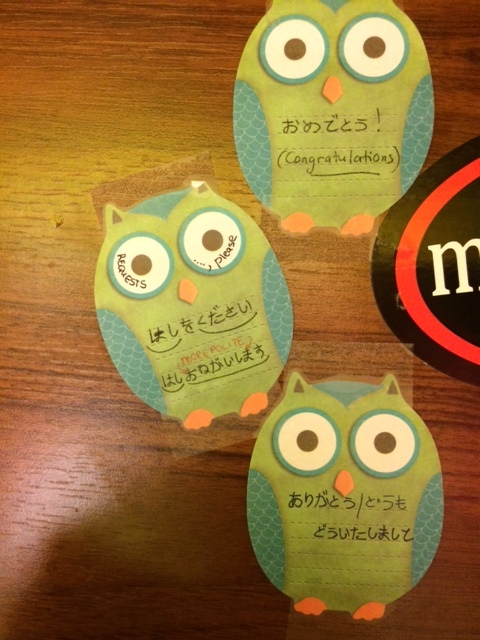 The three owls are staring at me daily with the easiest of conversational Japanese. One of these days I will be giving them neighbours, there are a lot lined up waiting. I’ve found these owls have truly done their job well – I can assure you I know these phrases. Next up – the box. Old-style cards with random Japanese words and phrases I pick up from here and there (written in kana and where possible in kanji lately) and the English for them on the other side. No context for them as yet. I hope you now have at least one question on the tip of your tongue finger about this box contents. Save it for (2), please. I have no course book. This picture book is the only book for Japanese studies I have, and this is now maybe a shame, already. While being openly a let’s-stay-away-from-coursebook teacher, as a learner I have ironically started wishing for a nice glossy-paged thin volume of something with exercises I could mechanically complete. I would then see the pages covered as an achievement and would likely brag about that now. However, in my one episode of a Japanese coursebook hunt, the books I found were offering me to learn Japanese through Russian AND through the methodology of the 60s. I politely refused. Apart from the book I have a whole file for kanji writing practice. From this website I downloaded all kinds of seemingly relevant files, one of which was the first 103 kanji with stroke order and space to practise. I’m taking my time, going through them at my own *snail slow* pace. One of my two notebooks for studies is the one for random, or all, kind of notes. There’s no structure there at all. The pages at the back of the notebook would reveal my attempt at keeping vocabulary lists but it didn’t work out for me, I see no reason/use in having words listed like that. That is, at this particular moment, for myself. The other notebook was just started a few days ago and is for recording and practising grammar and vocabulary from this app. The app is great for me since its materials are accessible offline and that’s what I need, since I spend hours in Moscow metro where wifi is still a promise. The initial Tae Kim’s Guide to Learning Japanese looks to be a comprehensive resource in itself and I just wish I had time or whatever it is I need to check back there once in a while. Plus I’ve just now joined the corresponding FB group, whatever that means for my future studies. While speaking of apps, here’s the last picture for this post. Phone and iPad screenshots for this folder would be about the same. I have only used Sketches app on the phone to practise drawing hiragana, but I now think maybe I could get back to it for kanji as well. My point is having/writing the same things (characters, words, phrases) in different places around me: in pen&paper notes, in phone or tablet notes, in apps, on sticky notes. There are two more apps in this folder I haven’t found a way to make real use of, so they’re waiting for their turn. 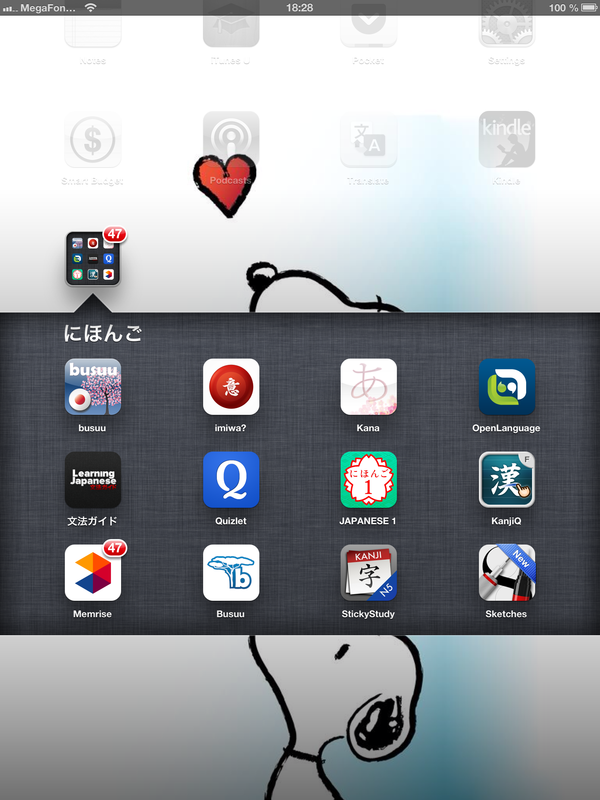 One app I’m totally not getting is… Quizlet. I created sets, I played with them, I tested myself. It’s not interesting for me and I’m not impressed or convinced, or unhappy about it either, for that matter. I am happy though that I found this blog by Matthew Ellman. Matthew recommended me to try out Memrise for myself, which I did. You can see there were 47 notifications from the app at the moment of taking the screenshot, and that should prove I’m studying but somehow lagging behind the app) Actually, Memrise is surely in top 3 useful resources for my Japanese vocabulary, so thanks very much, Matthew. Busuu is pretty great and I used it quite consistently and successfully for two months last summer to pick up some basic Italian before my holidays there. What I like(d) about it best was that there’s this community part of every unit you go through, where you’re asked to produce some language based on questions they ask or commenting on pictures, etc. It did work for my super basic Italian, and is yet to be seen for my ultra basic Japanese. 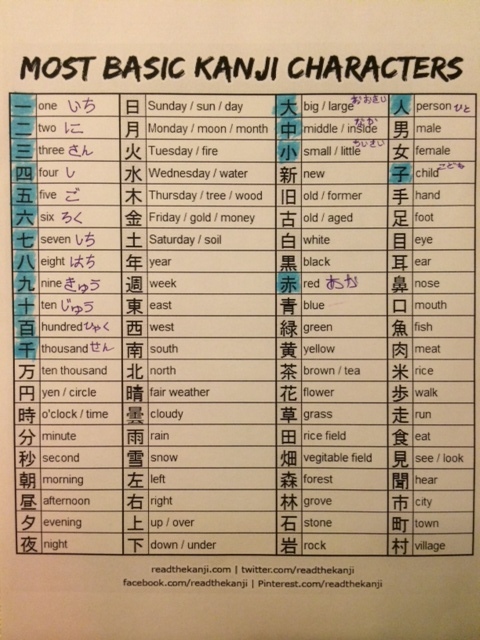 What are other “materials” I turn to in my relaxed/ lax approach to self-studying Japanese? * Video and audio podcast from JapanesePod101.com. They’ve got plenty of collections aimed at different levels and for various purposes. Only from one introductory audio I learnt (and remembered) when and why to say いただきます (itadakimasu), おいしい (oishii), まあまあ (maa maa) and ごちそうさま (gochisousama). * Being an Instagram addict user (frequent but sensible), I follow several accounts which post pictures for learners of Japanese, or accounts of learners of Japanese. I find it useful and interesting to study hashtags in particular, even if かわいい (kawaii) seems to be the all-around favourite. * Every day there’s at least one status update in Japanese in my Facebook feed. When it doesn’t look too daunting, I copy it out (especially so if it’s just one line) and break it down with the help of the dictionary. * There are occasional blog findings that refer to the language or culture that I go through (like, for example, recently this post about the blood types of Japan, or RocketNews24). 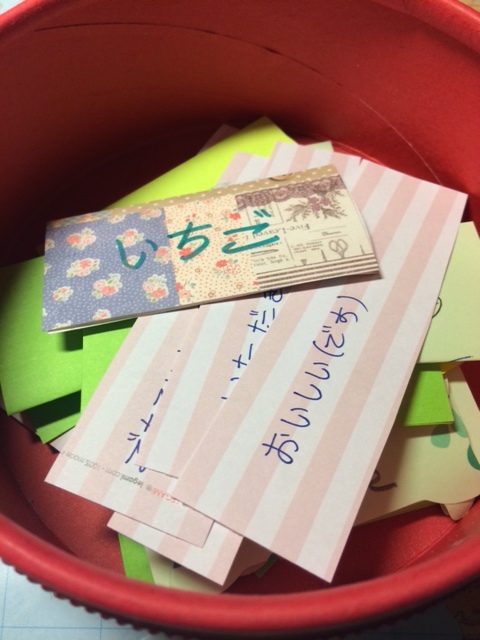 * In the Facebook group for students I have written about there are enough active members from Japan, and I sometimes learn from them as well (またね- matane, for instance). * I try to read every product label in Japanese that I happen to see. That’s difficult, as they’re mostly written in katakana (which as I said I’m still struggling with). Besides, it becomes impossible as soon as I see a row of kanji characters. * I watched “My Neighbour Totoro” for the 4th time with my niece this weekend, and while we understandably were watching it in Russian, I was happy to note that I could catch and understand some bits of original Japanese there. Or catch, type in a dictionary and learn a new word (まって- matte). – My decision to go for self-studying is a conscious choice. Is it the right track? Am I losing much? A week ago I wrote a post on how/IF teachers can motivate students to learn a language outside of class. My case is *formally* no class. Who motivates me? Am I motivated? What’s responsible for that? Would classes help motivation and/or progress? – I’ve mentioned “here and there” above. Well, this is exactly the essence of “my method”, which I still almost believe should work one day. Sporadic, spontaneous nature of learning… is it the nature of learning a language, especially when you’re thousands of miles away from the target culture? My biggest concern about the success of my studies comes out of my most grounded belief that I don’t need a rigid system to reach a certain language level. I’m ready to reconsider. – It’s true that the only person I speak to in Japanese outloud (introducing myself, asking for chopsticks, greeting, encouraging for studies, etc)) is me. This is one big problem with opting for self-studying Japanese in Moscow. I invite you to ask me more questions. I am making an effort to surround myself with Japanese. Am I learning it? Some learning is happening, but because it’s unsystematic, or because it’s been a while since I last diligently spent 15 minutes per day for 7 days in a row doing something, the current feeling is that of self-doubt. I have a very vague idea of how sentences are structured. Though, of course, I have a big picture and know a lot more than I did 5 months ago, and I’d now come up with several very simple “can do” statements for myself. If need be, that is. (3) This morning I’m excited again. One result of a tweet exchange around the topic of teachers learning languages was the discovery of Kimchi Bites blog where Martin Sketchley shares his experience self-studying Korean (this particular post with the comment thread was key for inspiring me make an action). My immediate plan is to put this present excitement into practical solutions. 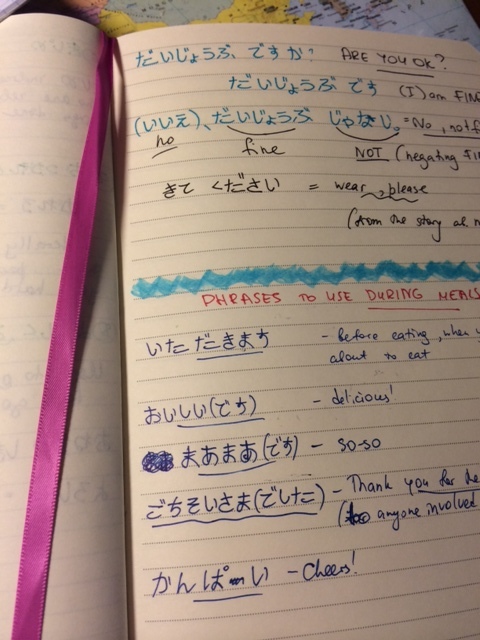 Realistically, I won’t be able to run yet another blog, so I’m going to blog about how my Japanese is going here. The regularity cannot be promised, but is hypothetically a post once a week/fortnight. Another result is this realistic challenge from Matthew. Looks like the next post in the Japanese series is round the corner! Community support, nudge and competition is fun and exciting. This post, however, is over now. You have read 1800+ words. Arigatou. Are you considering taking a Japanese language exam in the future? How often do you study in a week? For me I study about two days per week for around two hours. Do you read anything about Japanese culture? Thanks for the language cards in a pot. I’m going to try this out. If I need an exam certificate for a job or other, I will be taking an exam, of course. I was thinking of doing JLPT N5, but I”ve read about it and I now doubt that it has much value for me..I’m not sure. The exam sections cover Reading and Listening and thus check understanding. I read blogs and some articles that I see shared on Facebook by my many teacher friends/colleagues who live there. I’m glad the pot thing appealed to you. Good luck with your Korean! I’ll be following your progress through Kimchi Bites now, I’m really interested. Thanks for a great idea once again. I’d like to recommend the Mindsnacks app: http://www.mindsnacks.com/subjects/japanese I was using the Mandarin one for a while and learnt a lot of words from it, although I haven’t played it for a long time. I was quite addicted to it. You get a bit free, then pay for me, but I think it’s worth it. Unfortunately there’s no Russian one yet, although they say they’re working on it. Thank you for your recommendation, I made a note of it and will check it out one of these days. Very interesting, Ann, and impressive. Makes me a bit ashamed, too! One thing I found interesting was how you found Memrise in comparison with Quizlet. Some people rave about the latter, but my own experience was just like yours. Sharing an inspiring post by Ann Loseva, an English teacher from Moscow whose blog is a joy to read. Ann talks about her experience teaching herself Japanese, and in the process, explores what learning through the use of apps, resources online, and support from other learners online might look/feel like. Her blog post made me ponder on whether learners need for a schedule or curriculum to make tangible progress in language learning -a given for most of us teachers of ESOL, but something she seems to be exploring at the moment. And wait, did I mention she’s teaching herself Japanese?? If only for that impressive reason, you should read her blog post and discover how she’s doing it. Thanks Ann for planting a little seed inside my head and making me think about teaching myself my dream language, Arabic. There’s something incredibly empowering in knowing that with all the resources online and enough motivation, I could perhaps make it happen! 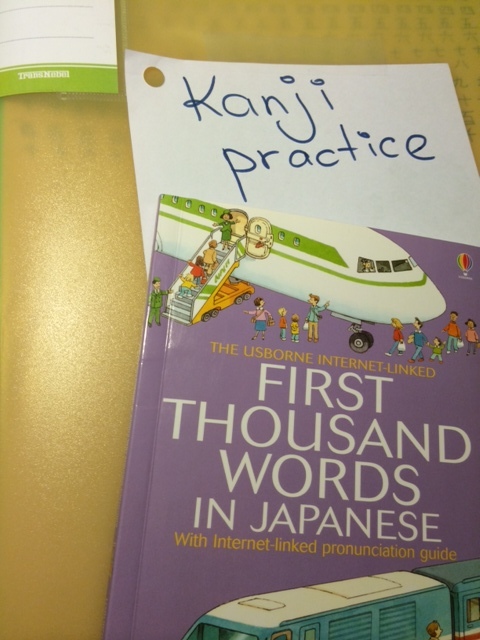 Looking forward to continue learning about your experience learning Japanese.